What are these? Where did I find them? Who do they belong to? Full rules are here, and don’t forget to look for hints. Good luck! This entry was posted in [No taxon] and tagged Puerto Rico, quiz, Super Crop Challenge. Bookmark the permalink. Eggs of the Krug’s sawfly (Sericocera krugii) on a sea grape plant leaf perchance? Yes, indeed, and congrats on being the first to get the right answer and nabbing a few early-bird points. You would have won if you’d also given the order and family! 2 pts each for genus, species, stage, and host and 2 early bird points = 10 pts. Well, my run here on the ID Challenges appears to be ova. Obviously, these reddish structures are the escape pods of the Crimson Permanent Assurance, last seen in London, but rumored to have set sail for Puerto Rico…Hey, as long as I’m going down in flames here…but okay, let me at least make it look like I’m trying. 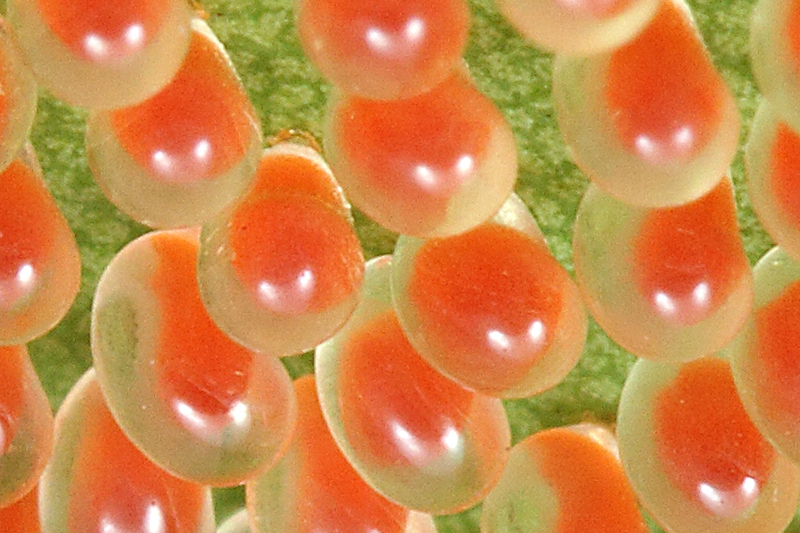 These are actually insect eggs attached to a leafy plant substrate. Based on the reddish color and having perused a few images here and there, I’ll take the wild guess that these eggs belong to Krug’s Sawfly, and that the substrate is seagrape. From the hint provided, you found these eggs in Puerto Rico, where it is rumored that the Crimson Permanent Assurance sailed after pillaging London…..
2 pts each for order, genus, species, stage and host and 1 early-bird pt (but not family—that is Argidae rather than Tenthredinidae) = 11 pts. The first impulse is to call them eggs, but I’m not quite sure. If they *are* eggs, then they are about to hatch, because the contents are pretty well developed. But I’m going to go with “young larvae”, because if they are gall midges, then they have had time to irritate the plant into making a gall for them already. Well, if I’m going to be wrong, at least it’s *definitely* wrong. And I have no idea whether Chokecherry occurs in Puerto Rico, but I suspect that *some* related plant must be there. Prunus occidentalis occurs in Puerto Rico, but chokecherry (and certainly the gall midges associated with it) is a decidedly northern plant. I forgot to mention – correct order, family, genus and species all earn points. It looks like folks are having a little trouble with this one, so don’t be shy – even if it’s just a guess. The only way to guarantee you don’t walk away with points is by not trying! Hi Ted, I don’t have much time or energy to spend on this one. So I’m going with my gut. It looks like a cluster of eggs (but you’re tricksy), probably Coleoptera (you are a coleopterist). I saw the clue about Puerto Rico, but that’s not much to go on. They’re laid on the underside of a leaf, so I’ll go with Chrysomelidae (Leaf Beetles). Beyond that…you did recently write an article on Calligrapha, so I’ll go with that for genus. In addition to the 2 pts you get for correctly deducing they were eggs, I’ll give you 2 pts for acknowledging that I am “tricksy”! My first thought was that these were butterfly eggs, but I couldn’t find any that were clear like these. The ridges on the larva in the lower left egg reminded me of a sawfly larva so I tried searching for sawfly eggs. Eventually I came across photos of the eggs of Krug’s sawfly, a species from Puerto Rico, that looked pretty similar to your photo. So, I’ll say Order–Hymenoptera, Family–Tenthredinidae, Genus–Sericocera, species–krugii. If these are the eggs of Krug’s sawfly (also known as the seagrape sawfly), then I’d guess they are attached to a seagrape leaf. While you could have found these in Puerto Rico like the tag suggests, you’ve recently posted photos of arthropods that were reared in captivity. I’m going to take a guess and say you found these in California and that they are some of the insects being reared by Dr. Martin Hauser. Better late than never—it was the presence of numerous photos of Sericoceros eggs on the web that convinced me this super crop could be identified. 2 pts each for order, genus, species, stage, and host plant (but not family—that is Argidae rather than Tenthredinidae) = 10 pts. And I really did see these in Puerto Rico. As a complete guess after a very brief google search, I’m going to say that the red/yellow orbs pictured are eggs of the seagrape sawfly Sericoceros mexicanus. The females lay eggs in clusters on leaves of the seagrape plant, Coccoloba uvifera (which is the green background) and then watch over the eggs until they hatch. Not bad for a complete guess. You only missed the species (mexicanus does not occur in the West Indies). 2 pts each for order, family, genus, stage, and host = 10. I am also giving you a bonus point for being the only person to give the scientific name of the host and another for being the only one to mention the female egg guarding behavior. That’s 12 pts and gives you the win! Answers haven’t been posted for the current challenge, so points are still up for grabs! I can’t decide if this was too hard or too easy—most of the participants correctly guessed these to be eggs of a seagrape sawfly in the genus Sericoceros (order Hymenoptera, family Argidae), even catching the “Puerto Rico” hint in the tags to narrow this down to S. krugii, the only species of the genus found in the West Indies. However, only six people ventured a guess—far below normal, suggesting that a great many people didn’t have a clue. At any rate, full details are available in the following post, and points are awarded to the participants in replies to their comments.